Our electric shaver for men will offer you an easy and convenient way to shave with an affordable price. 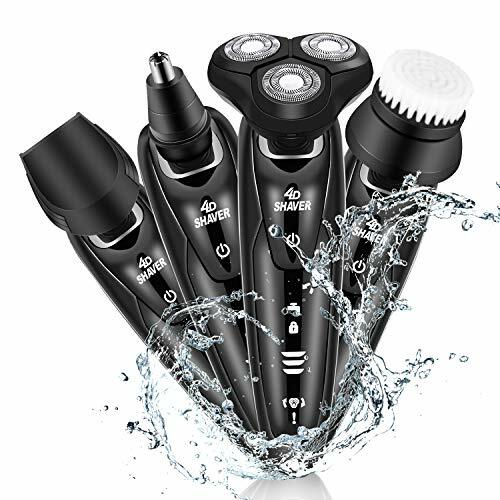 Our electric razor kit is 4 in 1 multi-functional washable floating head rechargeable wet & dry rotary shaver. Including electric razor,facial cleaning brush, beard trimmer, nose trimmer. Our electric rotary shaver provides you a comfortable and close shave each time. When your beard is long,you can use beard trimmer first, then use the razor.On this way,you can achieve better results. 1. 4 In 1 Grooming Kit : 4-in-1 smooth shaving for shaving beards, trimming corners, trimming nose hair, cleansing the face, affordable, with V-track precision blades that automatically adapt to face, neck and jaw contours. 2. Smooth & Quick Shave: With 4-direction floating heads, the 3D rotary shaver automatically adapts to the contours of the face, neck and even the jaw, and provides a comfortable and close shave every time. 3. Waterproof & Wet Dry Shaver: IPX6 grade waterproof, easy to clean. Dry and wet shave, enjoy dry shaving or use in the shower. The shape is ergonomic, easy to grip and use, and the sound is moderate. Gift packaging, A good choice to your friend. 4. Long Battery Of Electric Shaver: This men electric razor has long-lasting lithium battery, which is perfect for your travelling. USB charging is convenient and durable. 5. Upgraded LCD Display: This electric razor for man has a intelligent LED display, which can remind you about the shaver status, including battery level, charging indicator, travel lock.